Sun Protection, Nanoparticles & Vitamins. Adults are usually better at protecting kids from the sun than themselves. The roller coaster of modern life can often leave us wondering if it’s worth the time and effort to prevent something that may never happen a few years down the track. In Queensland, that argument just doesn’t hold because around 80% of Queenslanders get skin cancer at some stage. We all know that UV light damages the skin. Indeed, UVB damages DNA, leading to inflammatory changes such as Sunspots. In this sense, Sunscreen offers immune protection. Apply it liberally. It takes around 35mls of sun protection to cover a body. Apply it 30 minutes before going out, and again just before going out. When you know you are going to sweat, use water-resistant sun protection, and apply it more often. The resulting skin damage from a tan outweighs any tiny protective effect against later exposure to The sun. Around 80% of UV radiation passes through clouds which is why you can get sunburnt on a cloudy day³. Light shade is only equivalent to a sun protection factor of 2! At what age can you trust kids to apply sun protection without supervision? This is a thorny question but it’s not unusual to see adolescents with severe sunburn. Is your kid very resistant to using sun protection? Then ask your doctor to help at the next visit. When Should I use Sun Protection? Even small amounts of UV Exposure increase the risk of skin cancer. However, we all know that vitamin D is good for us, and that Vitamin D Deficiency is the other side of the coin. A sensible compromise has prevailed in latest draft guidance between skin cancer experts & Endocrinologists. The idea of always covering up has gone out of the window. So what do these guidelines say? Use sun protection for activities outside lasting more than a few minutes when the UV index is 3 or more. This table shows the average daily UV index at noon in different capital cities. It’s worth noting that more Vitamin D is produced by exposing larger areas of skin to smaller amounts of sunlight, than smaller areas of skin to larger amounts of sunlight. How is The UV index used? Let’s look at Brisbane where the average lowest UV index – in the winter months – is 3. Umm, you say, this is more than 2 and so I’ll need to use sun protection every day of the year. Not necessarily. The average UV index in the table is at 12pm, and you probably won’t need to cover up earlier or later in the day in the winter months. The average UV index at noon in the middle of the winter is still high enough to recommend regular sunscreen in Perth, Darwin, Cairns & Brisbane throughout the year. In Sydney, Perth & Adelaide you should be OK in June & July. In Melbourne, it’s usually OK to stop using sunscreen in May, June, July & August. Someone working outdoors, playing golf or boating really should check the UV index. For the daily UV forecast then check out MyUV, or download the sunsmart app for your phone. This will provide the best indication as to whether you need to slip-slop-slap on any given day. 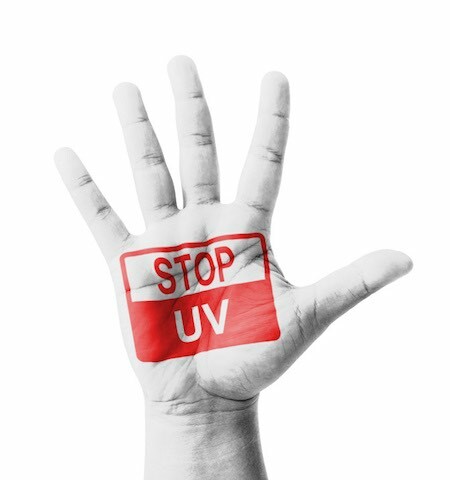 UVB that is the main cause of sunburn and non-melanoma skin cancers. UVA that is also carcinogenic and the main cause of photo-ageing. Physical Sunscreens that physically reflect both UVA and UVB. Typical ingredients are Zinc Oxide or Titanium Dioxide. Organic Sunscreens that absorb different types of UV radiation. Examples are octinoxate, salicylates or benzophenones. The white stuff that Professional cricketers often have on their nose is the traditional physical sunscreen – very effective but messy to use. This led to the development of smaller physical particles called nanoparticles. The Zinc or Titanium particles could react with UV light to become “Reactive oxygen species” (ROS). There is concern that ROS could be carcinogenic. Manufacturers have recently developed methods to coat the nanoparticles so that they are less likely to stick to skin. Nanoparticles are very small (1 to 100nm across). There is concern that they might be absorbed through the skin, enter the blood stream, and be potentially toxic. Research suggests that nanoparticles go no further than the very upper-most layer of the skin. This layer is constantly shed, suggesting further than nanoparticles cannot be absorbed into the deeper layer of the skin (The dermis). The TGA’s 2013 report into nanoparticles & sunscreen concludes that nanoparticles are “unlikely” to reach the human blood stream. The conclusion is that nanoparticles are very likely to be safe. However, talk over any concerns at your next checkup with your skin cancer doctor. Vitamin B3 is also called Nicotinamide and there has been evidence for some time that Vitamin B3 can help protect the skin from UV light. There’s good news in late 2015. A trial published in the coveted New England Journal of Medicine (probably the most highly respected medical journal in the world) was very encouraging¹. People who had at least two non-melanoma skin cancers in the previous 5 years were randomised to either placebo or Nicotinamide 500mg twice daily. After 12 months, there were 23% fewer non-melanoma skin cancers in those who had taken the nicotinamide. What does this mean? There is solid evidence to recommend Vitamin B3 (Nicotinamide) 500mg twice daily in anyone who has had at least 2 skin cancers in the last 5 years. This includes BCC and SCC. The same dose of Vitamin B3 had previously been reported to reduce Sunspots in people with pre-existing Solar Keratosis. You can buy Vitamin B3 tablets at the chemist & there are a variety of brands to choose from. Just make sure you get the 500mg strength tablets. 1: Phase 3 randomized trial of nicotinamide for skin cancer chemoprevention, N Engl J Med 2015. 3: Global solar UV index, a practical guide. World health organisation.